As a sports lover, over the years I've seen enough men and women who clearly cannot handle their alcohol, strip off their clothes and invade the game... whether it be an incident in international rugby where the streaker was absolutely smashed by one of the Wallabies, the incident many years ago with Bruce Doull (sic) of the Carlton Blues accosting a naked female pitch invader (or was it the other way around) in the VFL or even one event that I recall from my childhood, where during an international cricket test match, the drunken naked fan was whacked on the "private wickets and bails" (or the wrong ball?) by the then batsman, Greg Chappell, with the face of his cricket bat. Also as a sports lover, I cannot begin to describe how p**sed off it makes me when the game is disrupted in this fashion - without meaning to generalize (because there are streakers in every country, often driven by the booze and a daring bet with their mates), but there really seems to be a very strong statistical correlation between this activity and British sports fans (aplologies to my pommy mates)! Don't get me wrong - any Aussie will tell you - a few beers and sport go very much hand in hand... but the message here is - if you feel the desire to take all of your clothes off and run around naked in front of the players and fans (and sometimes millions of people across the globe watching on television), then please... either don't drink - or better still... stay at home!! This brings me to the crux of this article. 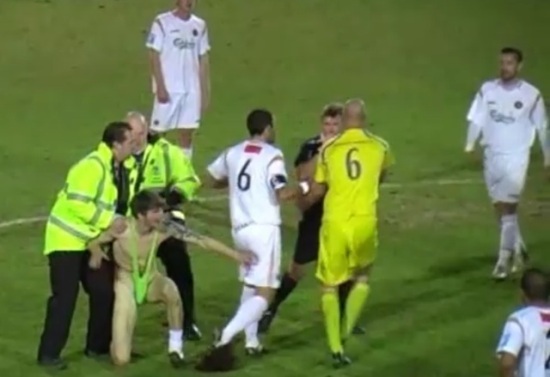 A male streaker - this time dressed in a "mankini" a-la Borat style, decided to interrupt a soccer game in England this week. Also wearing a wig, the pitch invader decided his 5-minutes of fame should happen during a lower-division match between Dorchester Town and Havant & Waterlooville. With very few fans in attendance, you can see in the video that the security guards made very little attempt to corral the idiot. This is when Dorchester Town's player-manager, Ashley Vickers, did what many other real men would have done - he tackled the fool to the ground. But wait!!! - under some very antiquated rule surrounding players and pitch invaders, the referee then issued Vickers a red card for his actions... WTH???!!! !